Oh I love it! I'm going to have to make one of those. I'm not really a shawl person but I like how you wear it. I think that both of those cameras would serve you very well! You will be taking amazing photos again in no time! Congrats on finishing that project, it is very pretty (although it looks awfully warm to be wearing right now). Haha, yes it was definitely way too warm. I'll be waiting for a day when it's at least under 75 before I take actual pictures of it! 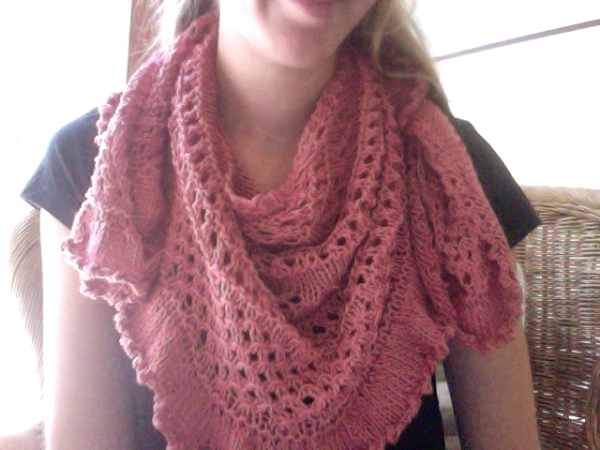 I'm really not a shawl person either - I always think they are so pretty but I never wear them. This one is great for wearing as a sort-of scarf. I knit it in cotton, too, so it's got great drape and it's light - you should definitely give it a try!